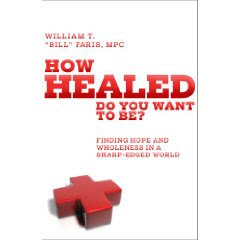 My Dad, Bill Faris, wrote a book titled How Healed Do You Want to Be? After about a year and a half of knowing that it will be published, it finally comes out this weekend. Contrary to what you are probably thinking about the title right now, it isn't a self-help book. It just recognizes the rather biblical idea that God doesn't typically zap us with insta-healing (especially emotional healing) but brings us through a process that we have a real part in. Anyway, it is a very good book (at least the early version of that I read was, though apparently it has been edited considerably, and that for the better). And as I said, it is coming out this weekend, starting with a book release/signing party down here in Southern California (South O.C.) that all interested folks are invited too. That will be this coming Sunday, May 3, and I'll certainly be there, and hopefully my wife will be too. Pretty sweet, right? I sure like it- though I'm probably pretty biased. For more info on the book and on the release party and on my Dad and so on, check out the book's website: www.howhealed.com. Hope to see you at the party. Labels: bill faris, how healed do you want to be? That looks like a really interesting book. It sounds like a much needed one in some circles given the prevalence of ideas that God will just zap you emotionally healed.